D Magazine just published their newest issue and it included the 2012 Best Doctors in Dallas list. 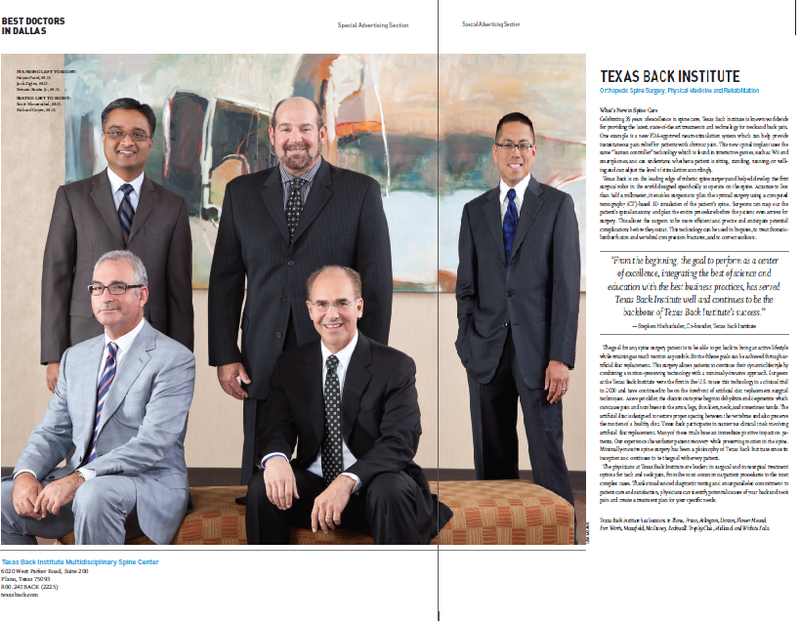 Texas Back Institute is excited to announce several of our physicians made the list. This year, Drs. Scott Blumenthal, Renato Bosita, Jr., Richard Guyer, Michael Hisey and Jack Zigler were all listed as “Best Doctors in Dallas”, by D Magazine. At Texas Back Institute, we know we have fantastic physicians, but it is always nice to have a magazine as prestigious as D Magazine say this as well! Check out our profile below. The write up is a little hard to read above, so see below for a close up. Celebrating 35 years of excellence in spine care, Texas Back Institute is known worldwide for providing the latest, state-of-the art treatments and technology for neck and back pain. One example is a new FDA-approved neuro-stimulation system which can help provide instantaneous pain relief for patients with chronic pain. This new spinal implant uses the same “human controller” technology which is found in interactive games, such as Wii and smartphones, and can understand whether a patient is sitting, standing, running, or walking and can adjust the level of stimulation accordingly. Texas Back is on the leading edge of robotic spine surgery and helped develop the first surgical robot in the world designed specifically to operate on the spine. Accurate to less than half a millimeter, it enables surgeons to plan the optimal surgery using a computed tomography (CT)-based 3D simulation of the patient’s spine. Surgeons can map out the patient’s spinal anatomy and plan the entire procedure before the patient even arrives for surgery. This allows the surgeon to be more efficient and precise and anticipate potential complications before they occur. This technology can be used in biopsies, to treat thoracic-lumbar fusion and vertebral compression fractures, and to correct scoliosis. The goal for any spine surgery patient is to be able to get back to living an active lifestyle while retaining as much motion as possible. Both of these goals can be achieved through artificial disc replacement. This surgery allows patients to continue their dynamic lifestyle by combining a motion-preserving technology with a minimally invasive approach. Surgeons at the Texas Back Institute were the first in the U.S. to use this technology in a clinical trial in 2000 and have continued to be on the forefront of artificial disc replacement surgical techniques. As we get older, the discs in our spine begin to dehydrate and degenerate which can cause pain and numbness in the arms, legs, shoulders, neck, and sometimes hands. The artificial disc is designed to restore proper spacing between the vertebrae and also preserve the motion of a healthy disc. Texas Back participates in numerous clinical trials involving artificial disc replacement. Many of these trials have an immediate positive impact on patients. Our experience shows faster patient recovery while preserving motion in the spine. Minimally invasive spine surgery has been a philosophy of Texas Back Institute since its inception and continues to be the goal with every patient. The physicians at Texas Back Institute are leaders in surgical and non-surgical treatment options for back and neck pain, from the most common outpatient procedures to the most complex cases. Thanks to advanced diagnostic testing and an unparalleled commitment to patient care and satisfaction, physicians can identify potential causes of your back and neck pain and create a treatment plan for your specific needs. Texas Back Institute has locations in Plano, Frisco, Arlington, Dallas, Denton, Flower Mound, Fort Worth, Mansfield, McKinney, Rockwall, Trophy Club, Midland, and Wichita Falls. Dr. Scott Blumenthal was the first Orthopedic Spine Surgeon in the US to perform an Artificial Disc Replacement (ADR) surgery. This life changing surgery has now helped over 1,400 Texas Back Institute patients. Recently SpineUniverse.com featured a blog post about the history of artificial disc replacement. How Long Has This Spine Procedure Been Used? Artificial disc replacement (ADR) or total disc replacement (TDR) is a surgical procedure which replaces a degenerated disc in the spinal column with an artificial motion device. It has been used in the United States since the year 2000, but it originated in Europe almost 30 years ago. Before performing the first ADR in the United States in March 2000, I did a lot of research on the procedure, including visiting with a number of surgeons in Europe as well as the inventor of the first FDA-approved ADR, Karin Buttner-Janz. Besides inventing the artificial disc, she is well-known for being an Olympic and world champion gymnast from East Germany. With 12 years of experience, we have now performed more than 1,400 disc replacements in our private practice alone. Patients now have access to spine surgeons with extensive experience in disc replacement right here in the in the United States. Total disc replacement is an alternative to spinal fusion. It is an innovative process of surgically removing a damaged disc from the spinal column and replacing it with an artificial disc. This procedure can significantly benefit patients who suffer from herniated discs or degenerative disc disease with or without leg or arm pain. Artificial disc replacement gives patients an opportunity to retain mobility in both the neck (cervical spine) and lower back (lumbar spine). By replicating the movement of a normal disc, ADR helps to alleviate adjacent disc degeneration minimizing the need for additional spine surgery due to disc degeneration or herniation. Since 2000, a number of FDA studies of other artificial discs began enrolling patients in the United States. Over a dozen studies have been completed in the United States and currently there are four discs approved for use in the United States. The FDA-approved disc available for the low back (lumbar spine) is the ProDisc-L. For the neck (cervical spine), the Bryan, Prestige, and ProDisc-C are available. Looking forward to the future of artificial discs in America: at least a dozen or so discs are either currently in-trial or have completed the trials for FDA approval and will hopefully be available in the US soon. Texas Back Institute is a global leader and pioneer in spine care, having performed more than 1,400 artificial disc replacement procedures with 14 different types of ADR devices, beginning in 2000 with the first ever performed in the United States. One of the latest advancements in spine surgery, artificial disc replacement gives our patients an opportunity to retain mobility and resume their lives with minimal pain or discomfort. Led by the world-renowned spine surgeons at our Center for Disc Replacement, we perform this motion-preserving, life-changing procedure on patients from around the globe each year. If you’re suffering from chronic back or neck pain, our concierge services team will help you coordinate all aspects of your visit to TBI so you can receive treatment from some of the best spine surgeons in the world. It’s your time to get back to life.